Beef stew is a life-saver in case you had to call in sick due to a cold or flu. It’s a kind of “old-school” meal you probably didn’t like eating when you were a kid; but now, with all the junk food around us, most of us get really happy when they feel the smell of vegetables and sage perfectly mixed with beef. Beef stew is very good for you if you have problems with digestion. And, as there are a lot of veggies involved in making this stew, it is also rich in fiber and vitamins, especially B12, which is very good for your brain, hair, nails, and skin. 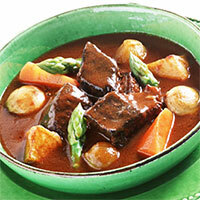 The calories in Beef Stew per 535.3g(1 plate) is 594 calories. Beef Stew is calculated to be 111Cal per 100 grams making 80Cal equivalent to 72.07g with 39.77g of mostly fat、24.09g of carbohydrates、23.34g of protein in 535.3g while being rich in vitamins and minerals such as Vitamin B12 and Zinc.